Nikki Valdez marries Luis Garcia in Hong Kong. Nikki Valdez is now Mrs. Luis Garcia. 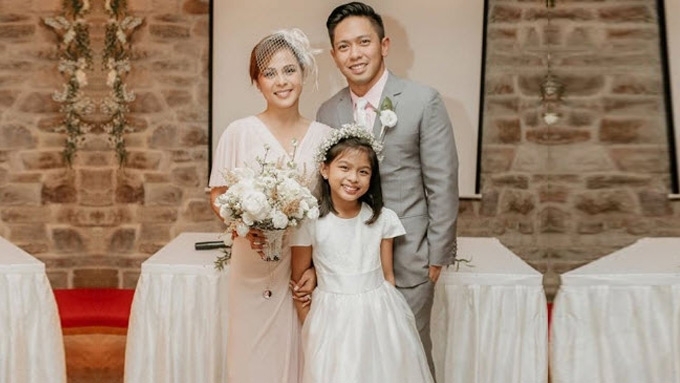 The ABS-CBN actress married the media executive-triathlete in a simple civil wedding ceremony in Hong Kong yesterday, August 18. She wrote on her Instagram, "Cannot ask for anything more. "I love you, Jesus. Thank you for giving me the best day of my life!" Nikki's 10-year-old daughter Olivia was part of their entourage. Nikki, Luis, and her family arrived in Hong Kong over the weekend. The couple kept the exact date of their wedding private, but their celebrity friends sent their best wishes on the post. The Sana Dalawa Ang Puso actress donned a pink Rajo Laurel wedding dress. Nice Print Photography took the official wedding photos. Nikki and Luis got engaged back in December 2017 in Vigan, Ilocos Sur.